Dining rooms can be a great room in which to experiment with colour because you don't spend extended periods of time in there everyday. Rather, it is often a space used for entertaining and so what better way to impress guests than with a quirky hit of colour. These four schemes detail original, eye-catching statement ideas for introducing bold hues into a dining space. I do like the simple red, white and blue French- inspired scheme of number one, and the 'ravashing regency' scheme certainly packs a punch when it comes to winning my affections. 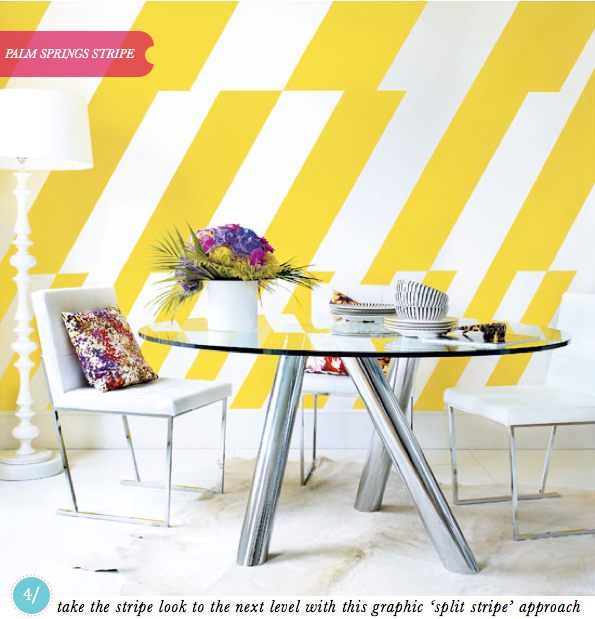 However, with a striking mix of graphic elements and hot yellow hues, 'palm springs stripe' wins out in the end. Which one gets your vote? Quirky and fun, alright! The gray shadow look takes the cake! Thanks for the dining room inspiration! We are moving to a house with a formal dining space (which we don't have now) and I've been wracking my brain trying to think of how to fill the space in a fun (i.e. not stuffy) way. Number 2? Yes, please. The stripes definitely have it for me! So fun!! Lots of inspiration here! 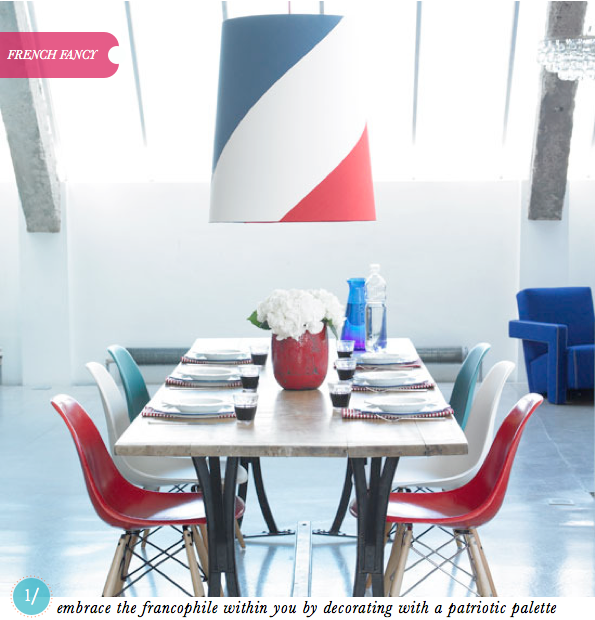 I think all solutions are great, but i'd probably choose the Francophile look! I love the the yellow stripe one but the shadow effect is really fun too!! 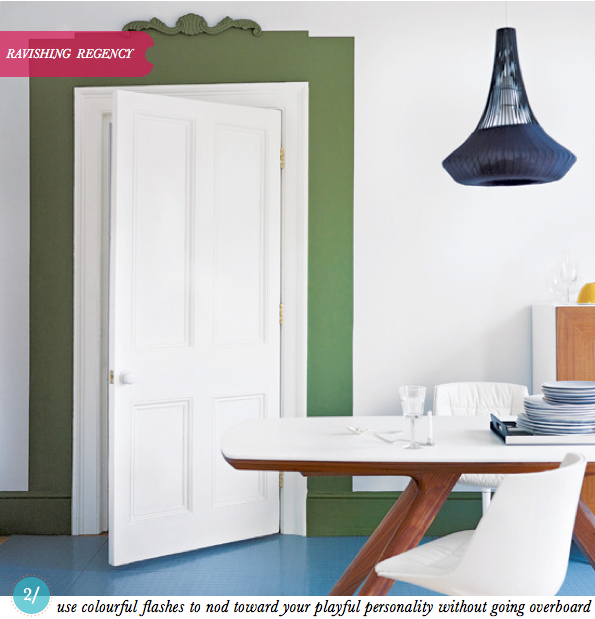 the coloured chairs is such a fin idea!! I can imagine you seating there sipping your vino! Very cool blog. A lot of details in the descriptions too. We really love that. Also, the Palm Springs striped photo is so lively! 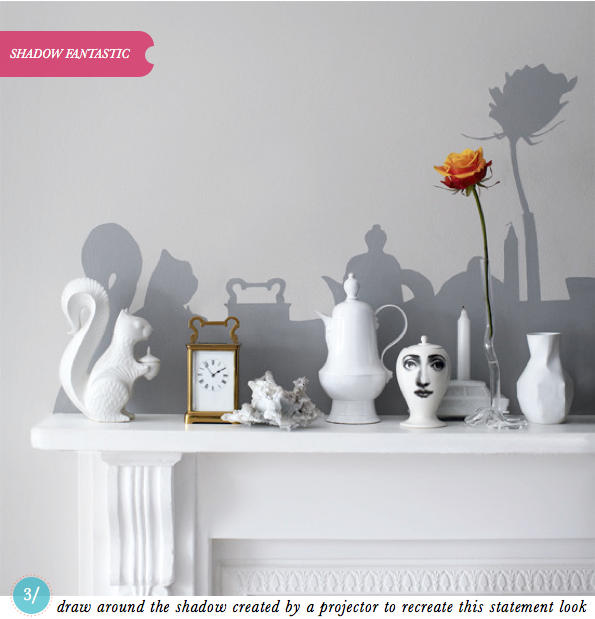 I'm loving the shadow art, it's so brilliant, I think the same idea can also work beautifully in a kids room. I don't think I ever got a chance to say this but I love your blog, you always have unique posts that I haven't seen any where else and it's always a pleasure to stop by. 'Fantastic Shadow' gets my vote, what a wonderful and original idea! Would work beautifully in any room especially a kid's room. You always post THE BEST pictures. I think my entire Pinterest catalogue is yours, haha. Love, love, love that first picture!